I was keen to host a number of traders meeting in Naas and Maynooth following increases in rates as set out by the Valuations Office. 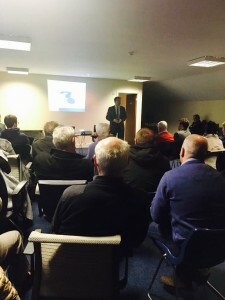 The meeting were addressed by Declan Lavelle of the Valuations Office, Charted Valuations Surveyor Eamonn Halpin and chaired by Allan Shine of Kildare Chamber of Commerce. In Maynooth Declan Kennedy of the Maynooth Business Association chair that meeting. It was extremely important I organised this meeting to allow traders the opportunity to speak directly with the Valuations Office. In some cases businesses have seen their rates rise by 300%. This is clearly unmanageable for many businesses who I represent in Naas. When this matter first broke I hosted 30 traders in my office to discuss their immediate concerns. Following on from this I decided to invite Declan Lavelle to Naas to engage with them. Last night’s meeting consisted of Lavelle explaining the rationale behind the how the valuations office came to these decisions and most importantly, how to appeal. I would urge businesses who feel their valuation is off to appeal before the April 18th deadline. I also want to thank the contribution of Allan Shine and the Kildare Chamber of Commerce for hosting the meeting.